Sometimes I feel like I have the culinary tastes of a four-year-old. I can eat hotdogs cold with ketchup, love a good smiley face potato, and my heart flutters when somebody says “ice cream”. My palette has definitely expanded over the years, but I still like the simple foods in life. And there’s not much better, in my world, than a good corndog. We’re blessed living Oklahoma City—Sonic is headquartered here. And although I mainly frequent Sonic for their drink happy hour, it’s hard to resist their corndogs. Crispy on the outside, slightly sweet batter on the inside…all wrapped around a savory hot dog. Give me one packet of yellow mustard and 4 quarters and I’m set to devour this kiddo snack. But hey! Have you ever bought Frozen corndogs at the supermarket? They’re so expensive. A box of good quality corndogs can run you upwards of $10-$15! Insane! So, when my Timehop showed me a recipe of DIY Mini corndogs I had saved two years ago, I jumped at the opportunity to make them. Best part? You only need TWO INGREDIENTS! Guess how much those two ingredients combined cost? Go ahead…guess! …and good googly-moogly these are superb. 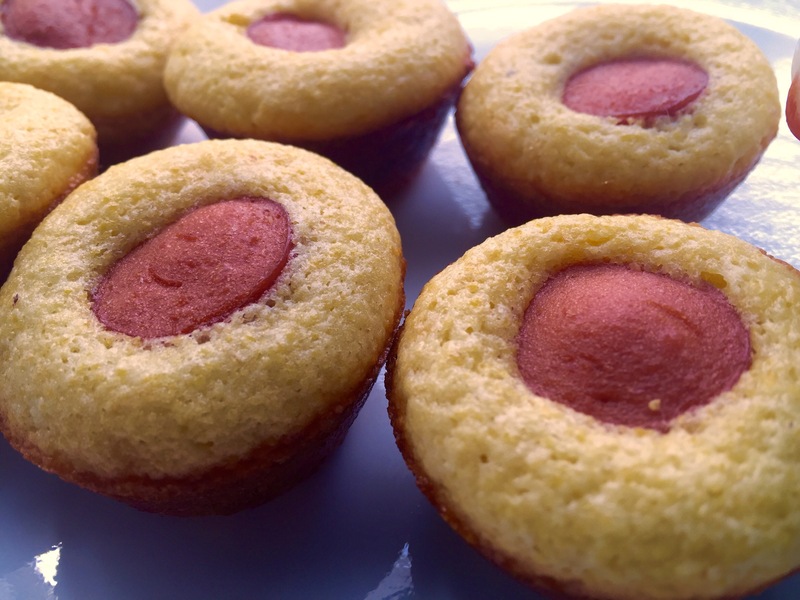 I should invest in stock for Jiffy Corn Muffin Mix, I use it so much for different recipes. This is just another recipe I’ll have up my sleeve whenever I have kids! 1. Mix corn muffin mix according to package directions (ok, so you need two more ingredients: an egg and some milk). 2. 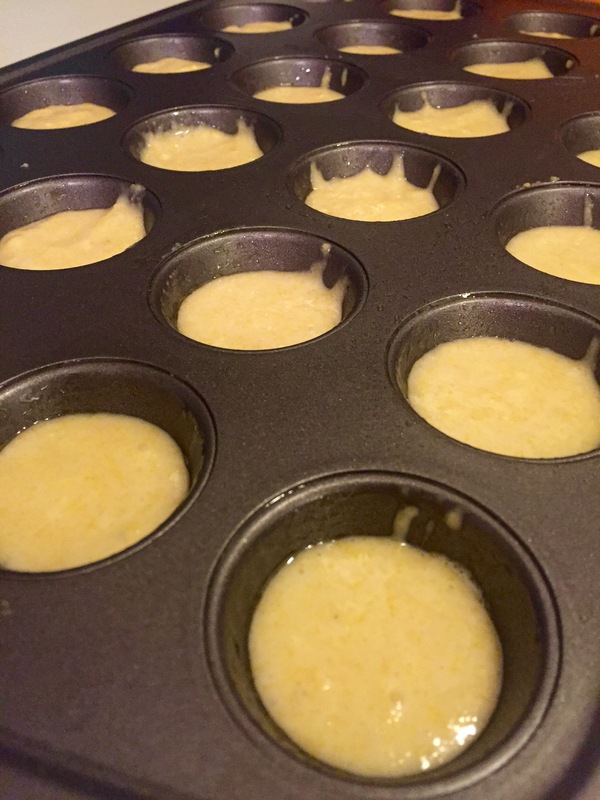 Pour batter into a greased 24 cup mini muffin pan. Fill cups 2/3 full of batter. 3. 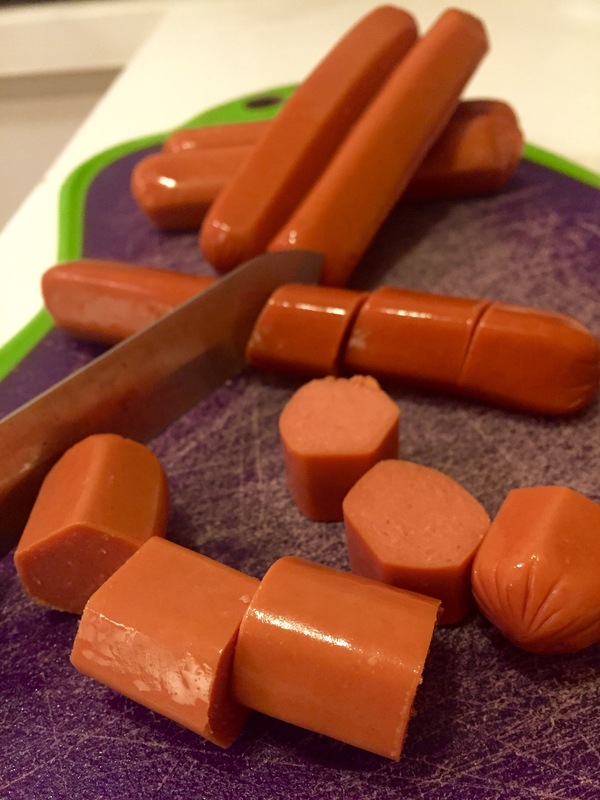 Slice hotdogs into 1/2″ slices (one hotdog should yield 5-6 slices). 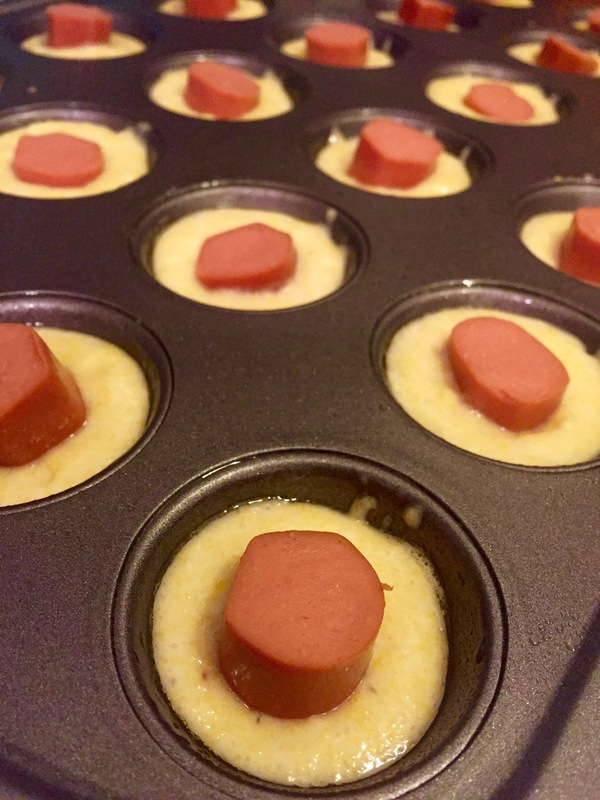 Press one hotdog slice each into middle of the batter. It’s okay if they stick up a little further than the batter! 4. Bake in preheated oven at 375 degrees for 10-12 minutes. This temperature is a little cooler than the Jiffy box says, so do NOT go by the box instructions! 5. Let cool and serve with ketchup, mustard or honey mustard! Skill Level: Extremely easy! A great recipe for kids to help make in the kitchen. And a great recipe for them to try, too! Flavor profile: It tastes like a Corndog, which is kinda what you’re going for. 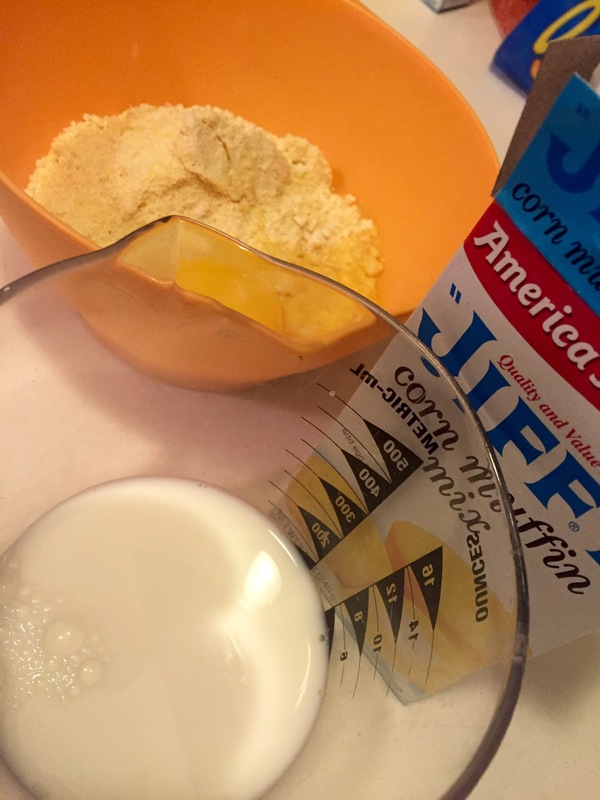 Jiffy mix is slightly sweet, which is what I like in a cornbread mix. I used Bar-S hotdogs because (1) they’re cheap (2) they’re made in Oklahoma (Elk City) and (3) you don’t need fancy hotdogs for this recipe! 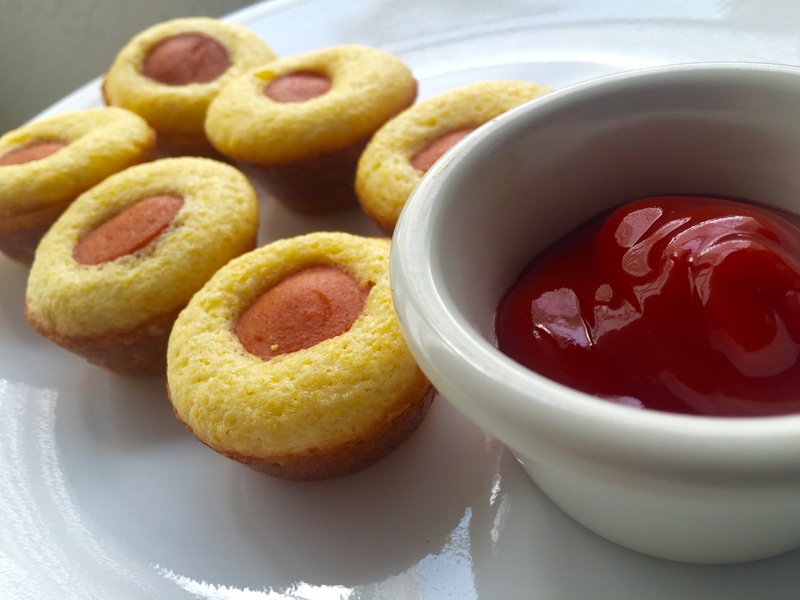 Versatility: You could sneak a piece of cheese into the batter with the hotdog if you like. You can also sub out with kosher hotdogs. End Score: B+. 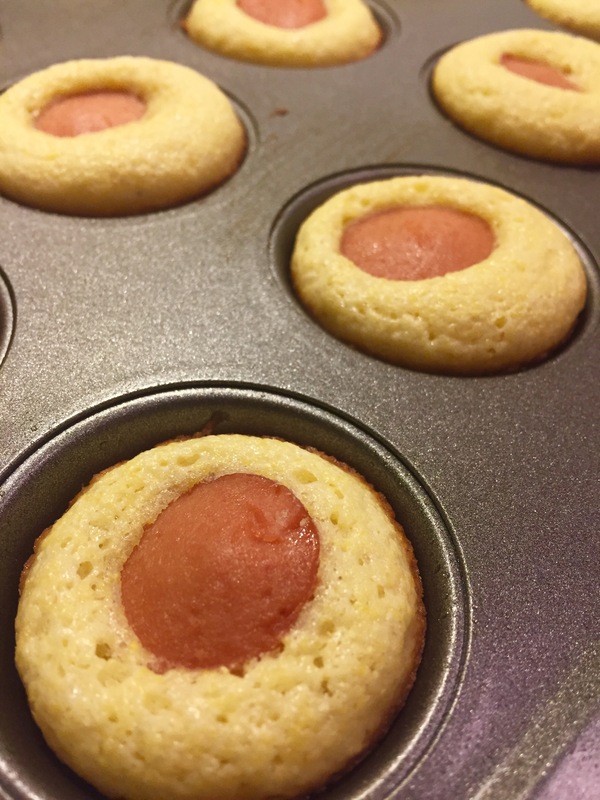 I probably shouldn’t be making these again until I have kids, or I’ll turn into one big Corndog! These are so good, though, so I couldn’t resist! You do realize you have made history in making such a sentence possible. They may build a statue of you. One can hope…one can hope! So cute! I’ve been looking forward to seeing these since your spoiler alert on upcoming posts! I’m going to have to make these for myself. Excellent game day snack idea too! And they’re so easy to make it’s not even funny! I’ll be making them often for parties and game viewing in the future, that’s for sure. These look good. I’ll admit I will probably use a recipe for the cornbread mix but am looking forward to making these bite sized snacks. Great idea. Thanks for posting these. Thanks! I’ve yet to make a good cornbread not from mix; so I usually use jiffy for muffins and Marie Callendar’s for a round pan. What a fun recipe! I like corn dogs, so I’m sure that I’d enjoy these.